One of the hard lessons in life that I had to learn was distinguishing between needs and wants. Sometimes I had a hard time knowing which was which. Sometimes, when I ignored that little voice in my head telling me I didn't need that item, I got myself in to some financial hot water. Lessons learned the hard way will stick with me the best! As I mentioned in the 13 Ways To Save Money In The New Year post, I had to learn to commit to spending no money for anything not on the goals list, that was frivolous, or unnecessary. I had to understand that unless it was a need or on my goals list, I was not spending the money on any unnecessary purchases. I have my monthly goals and my homesteading goals. I have my goals built in my budget. I am also working hard at being debt free as well as getting my emergency cash fund back up to where it should be (my monthly income times three months). I also have a small blogging budget and goals that I use to pay for this site and buy materials to expand my knowledge so I can give you more quality posts. My Ebay business has its own budget and goals that covers it very well and gives me a little side income. Everything in my life has a budget. While it does allow for a splurge once in a while, it does not allow for me to buy whatever old thing that catches my fancy. It also doesn't allow me to give in to my kids for every whim they want either! 2. How will it improve my life or serve my needs? 3. Does it apply to my goals? 4. Can I really afford it? Most of the time, what I really think I need is a want. Usually, if I really need something, it would already be on my list to buy. Makes sense, right? 1. Why do you think you need this? 2. Do you really this? 3. Is this something you can put on your wishlist? Do you want it for a holiday or your birthday? 4. Do you have your own money to pay for it? Most of the time, I can talk myself and them out of a lot of purchases. I usually only walk into a store when I have something specific to buy. I also remember I have a lot of projects at home that I want accomplish or goals that I want to conquer. I don't want to spend money on frivolous things and later be regretting that purchase when I don't have the money to spend on my goals. 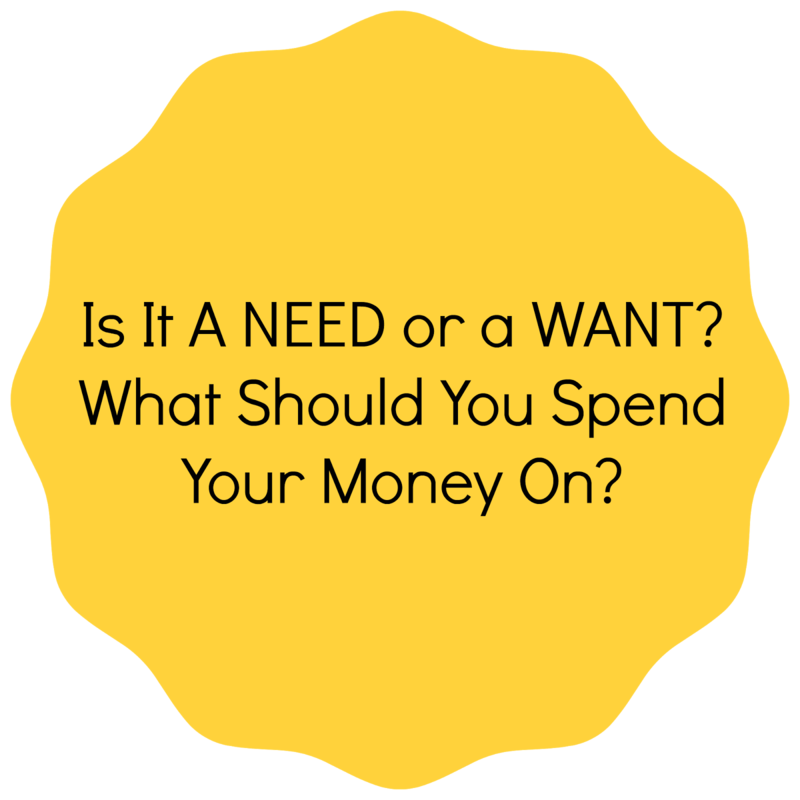 Do you know what the great thing is about separating your needs from your wants and not acting on those shopping impulses? * You have the freedom to control your money. * You know exactly where your money will be going. * You know that the reward will ultimately be the satisfaction of paying cash to accomplish your goals, go on vacation, buy a better car, and/or paying for a house. * You know you will be free from making impulsive and regretful purchases. * You won't experience the end of the pay period panic when your bank account is empty because of foolish spending. Figuring out what is a NEED and a WANT will help you greatly. You can still have a good life without all the stuff and the mindless spending. You will be happier, you will have better relationships, and you will be able to better afford the things you need further down the road!